Just as fashion trends, aesthetic therapies change with time. Some trends die out of the market while others maintain its position and become a steady seller. So are laser devices. Personally I would divide laser trends into 5-year periods: the mainstay around 1995 was strong lasers, including dye lasers, such as Q-switched Nd:YAG laser, pulsed dye laser and ruby laser, and lasers for skin resurfacing, such as Er:YAG laser, which removes all of the epidermis, expensive Co2 laser (e.g., Sharplan) and SilkTouch laser, and FeatherTouch laser. From 2000, softer procedures have taken the better part of the market. With rejuvenation procedures leading the trend, non-abrasive lasers and RF devices became popular. The most representative of softer procedures is IPL procedure, which is applied not strongly to a local area but broadly throughout the target area. For non-abrasive laser therapy, various devices have been introduced, including Polaris and ReFirm lasers, targeting the dermis without inflicting an injury to the epidermis. Among RF devices, Thermage is still widely used. The defining word for trends in laser procedures since 2005 would be ‘combination’. One of representative combination of strong and soft procedures is the fractional laser system. Starting from Fraxel laser, numerous devices adopting fractional technology with different wavelengths have been released, as well as devices allowing simultaneous output of multiple lasers or those equipped with various functions. What has been popular since 2010 can be discovered by observing what peer dermatologists are currently using. This article will introduce three most notable lasers among them. 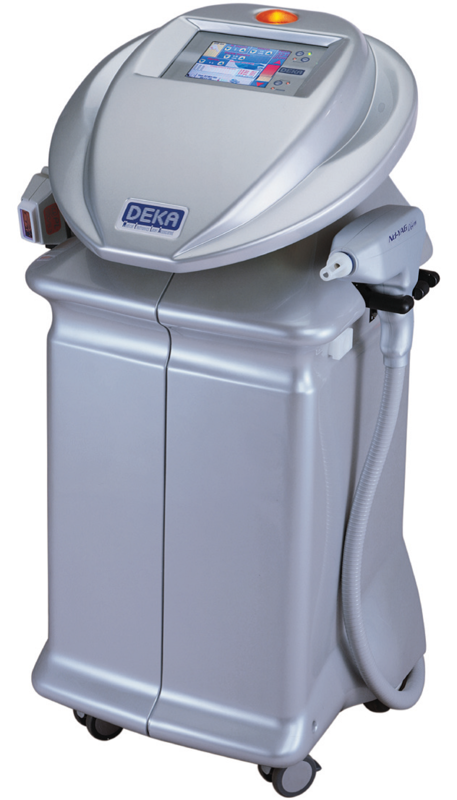 First to look at is Dermobeam 2000 (MEDITRONICS), a pulsed dye laser (PDL) from DEKA. 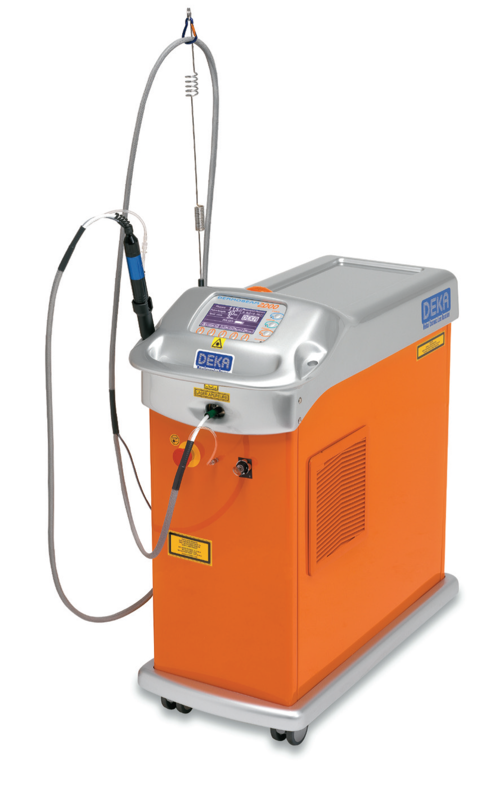 Pulsed dye laser uses liquid medium, unlike other lasers, and a wavelength of 585nm. PDL hasn’t changed a lot compared to other lasers which have evolved continuously. The only change would be the addition of an active cooling system to reduce pain and side effects. It can even be described as simple or naively honest. It hasn’t even been generally used or imitated. Vascular lesions are often treated by IPL or long-pulsed Nd:YAG laser in our clinic, but PDL seems to be the most effective one, which is why it is wanted by a lot of dermatologists for a better therapeutic effect. However, in terms of business management, PDL is not a laser one can purchase without hesitation, considering its high price and the cost of maintenance. In addition to the purchase price well over a hundred million won on average, 15 to 20 million won is required every year to replace the dye, which is why I purchased Dermobeam 2000. Dermobeam 2000 supports active cooling system by cryogen, with less purchase price and maintenance cost compared to other dye lasers. Such a low cost has allowed our clinic to provide vascular laser treatments at an affordable price to selected patients. Disadvantages are those commonly observed with PDL, such as bruise and pigmentation. In our clinic, acne, redness from acnes, facial flushing, capillary, hemangiomas and warts are common indications. Since PDL induces less pain, it is particularly useful when treating warts in children. IPL would be one of the most commonly used lasers, along with CO2 laser, in the majority of clinics; this is also true in our clinic. 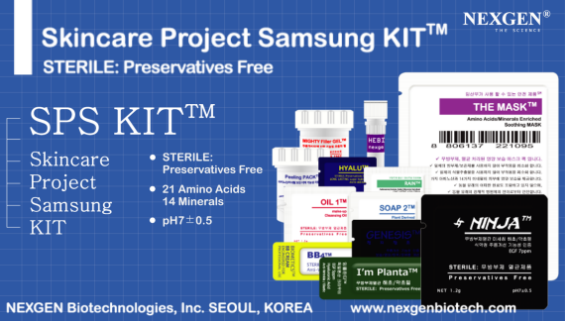 IPL has become more affordable and generally used so much so that it is now an essential device to buy when opening a clinic; however, it was a very expensive device costing more than a hundred million won in early days. First, it adopted contact cooling method unusually to reduce side effects such as burns (of course, this method is now adopted by most IPLs). Second, it supports more than 10 different modes, including but not limited to dye mode, vascular mode, rejuvenation mode and hair removal mode. It also allows independent control of each pulse, such as single pulse, dual pulse and triple pulse. These functions are handy when setting the device to meet what the operator wants from removal of hair to freckles, redness from acnes and telangiectasis. Third, the side of the tip is covered by a cap, preventing a streaming of light. This reduces the blinding effect for the operator, energy loss from light streaming through the side, and hair damages during IPL irradiation under the eye, next to the ear, or next to a mustache. These advantages are still quite satisfactory. Fraxel is the most influential laser since 2005. It is so famous that it doesn’t need to be mentioned, but Fraxel from SOLTA Medical in the US is an Er:Glass laser with a wavelength of 1540nm. Its higher absorptivity in the dermis than in the epidermis reduces epidermal injuries, and it creates tiny microscopic holes to stimulate dermal and collagen regeneration. When it was first introduced in 2005, its unfamiliar wavelength and therapeutic technique, as well as the application of blue dye and considerable pain, made Fraxel a little bit awkward to use. Afterwards, Fraxel has been upgraded to Fraxel Xena laser, which does not require blue dye and induces less pain and side effects while enhancing the depth of penetration and effectiveness. 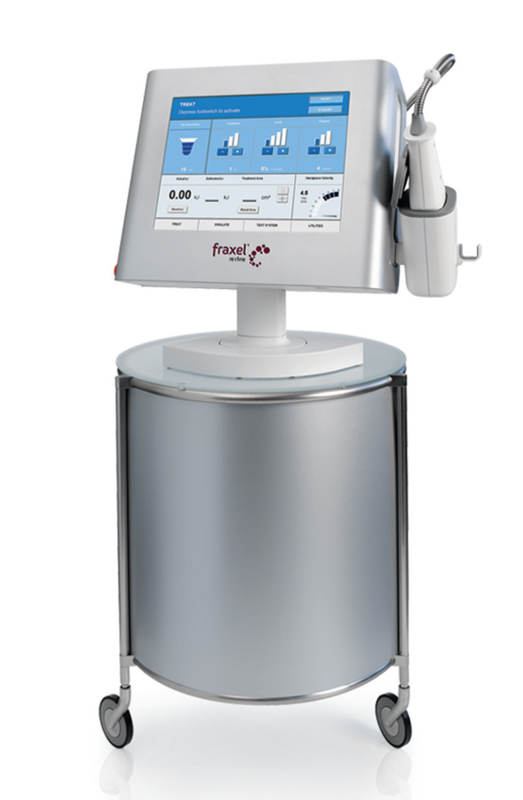 The most special aspect of Fraxel laser is that it does not require a post-procedural dressing agent or a long-term recovery, allowing patients to maintain daily life, unlike previous erbium or other lasers for skin resurfacing, which causes considerable inconvenience in daily life due to the application of an occlusive dressing (DuoDerm or Laser site). Disadvantages are less but still remaining pain and possible long-term persistence of erythema. Thus, I prefer to use nerve blocks, in addition to applying an anesthetic ointment, for patients sensitive to pain. The erythema may persist for several days after the procedure and dead skin cells may come off. The indication is extensive from acne or acne scars to wrinkles around the eyes and face, pores and general facial tone.